I love watching youtube! Not only do you learn awesome makeup tips but you hear about hidden gem products that just blow your mind. When a (smart) company first launches, their best bet is to use youtube guru's to promote and display their products because so many of us are subscribers to these channels! Some companies have had their business first "big break" because of these guru's. 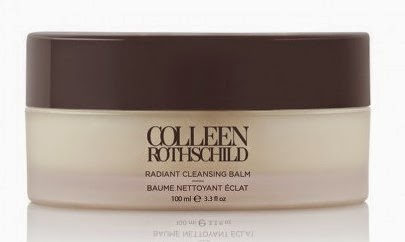 One of my favorite youtubers is Nicole Guerriero who a few months back spoke about this wonderful and I mean over the hill product by Collen Rothschild Radiant Cleansing Balm. 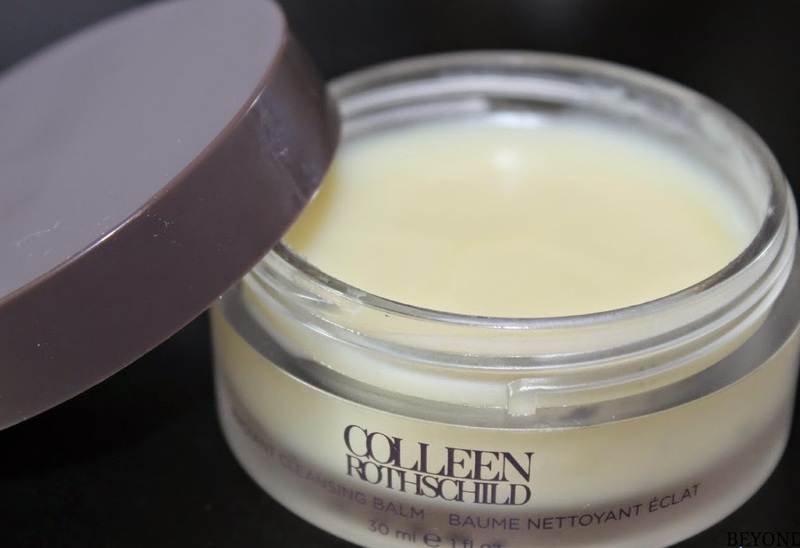 Now first, prior to watching that review I had never heard of Colleen let alone a cleansing balm. But let me tell you I do not regret learning about either. Colleen is a beauty expert with years of experience in the industry. After years of working in the business, she decided to "bottle" all she learned into making her own skincare line of beauty products. So you might be asking what is a cleansing balm and how are they different from normal facial cleansers? Good question because so was I. Cleansing balms are formulated with essential oils which are amazing for the skin. Plus they contain some form of either beeswax, paraffin, mud or some waxy (but in a good way) substance that helps to dissolve and breakdown makeup including waterproof mascara with no problem. The majority of these cleansing balms come in a jar. Some come in a squeeze tube which I would NOT recommend. Because of the waxy substance formulated in these products, these balms are thick. So just imagine trying to squeeze wax or mud through a tube? Yeah you can't can you!! Stick to a jar, it works better. One thing I hate is taking off my makeup. I love washing my face at night but I hate the time it takes to remove makeup. Nonetheless I NEVER no matter how tired I may be will ever go to bed without washing my face let alone with makeup on. Absolutely not! The welfare of my skin is to important to leave in that state at night or to just apply any product on it. Yet I still hate the time it takes to wash off makeup. However when I heard and saw that this cleansing balm can remove ALL your makeup in no time flat, I knew I had to try it! When this product arrived to my house OMG I was so excited I could hardly contain myself. However I had to wait till the next day to use it because I had no makeup on at that moment. This balm comes in a pretty large jar with a muslin cloth. The balm is a yellowish light tone in color that looks a bit waxy and has a lovely light smell to it. I ended up using this balm the next night when I had makeup to remove. I started off by applying a little bit on to my hands and working it into my dry face. I found the balm a bit thick though I only used a little, so I applied some water to make it easier to smooth over my face. I rubbed it in gently all over my face and on my eye area in order to remove my false eyelashes, waterproof mascara and eyeshadow that had not moved all day due to my primer being underneath. I then grabbed the muslin cloth, ran it under warm water and placed it on my face for a few seconds. I then started to gently remove this product from my face with the muslin cloth, and ALL of my makeup and I mean eye makeup as well came off with it!! I know that reading this blog you don't understand my shock but let me say it again "ALL of my makeup including EYE makeup" (waterproof mascara) came off with no problem. My lashes came off with no problem and no lash glue left behind. I had no "raccoon eye" effect left behind from the maraca. You all know what I am saying here for those who wear mascara. That is when your mascara comes off during the washing phase and falls underneath and around your eyes and now it takes either more washing or more eye makeup remover to get it off. Many times our eyes because raw and tender due to having to pass over the eye many times which has very delicate skin and not a good idea to rub hard. This product took off all my eye makeup with one small simple light pass with the muslin cloth. I honestly stood their just starting at myself in the mirror looking at my eyes for the first time and seeing no mascara anywhere! I was in awe as if I had just seen the greatest miracle on earth. Seriously I know it sounds dramatic, but for a contact lens wearer as myself, this makes a massive and painless difference. Just for that reason alone I would keep buying this cleansing balm. This product also worked wonders in removing the rest of my facial makeup and leaving me with a clean face that didn't feel tight or dry. At this point I didn't feel the need to use my cream cleanser because this cleansing balm not only removed my makeup but it works to clean your face as well. Some makeup removers only remove makeup but don't actually offer you that added benefit of cleaning your face thoroughly. So if you don't use another cleanser then you will be left with residual makeup, dirty and oil behind. You will notice it once you run your (non alcoholic I hope) toner on your face and see the residue on the cotton pad. 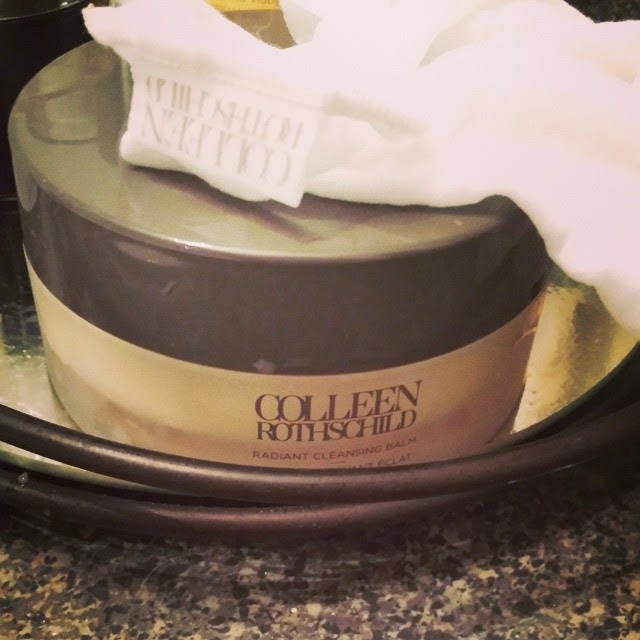 With Colleen Rothschild Radiant Cleansing Balm, I found that it did it all in one shot and my cotton pad was clean! The muslin cloth that comes with this cleansing balm is so soft and gentle. I have never used one in fear that it might be to rough on my face. However I was shocked with just how soft, durable and effective this cloth was. I have used this muslin cloth many times over and it has not stained, collected a bad odor or falling to pieces after every wash. However sadly, one of my kids recently went to my bathroom (which is forbidden as I have all my lovely face products there) and found the muslin cloth drying and ran off with it and has not been seen since (the cloth, not the kid). I am pretty upset about it, but at this point what can I do. I started using my Clarisonic Aria as an alternative till I can get my hands on this muslin cloth again. I may have to bite the bullet and just buy one from anywhere :( Eh first world problems I know. But trust me once you use this cloth you will understand why I miss it. Now I will be honest and say I only had two issues with this product which aren't massive but worth noting to the company. Colleen Rothschild does ship to Canada. Though I come from NYC I was pretty upset to see that for a balm of this size (which is pretty large but not massive) they wanted almost $20.00 for shipping. I had this instead shipped to my sister in NYC who shipped it to me for $7.50 US! Colleen, I think you might want to take a look at that shipping rate. Canadians here love to use tons of American products, but no one wants to pay that amount of money for shipping when those twenty extra dollars can be spent on your products. I would ask kindly that you consider re-evaluating the shipping rate or looking into distributors in Canada so that your awesome products can be sold here as well with a lesser shipping rate. My second issue was the fragrance in this jar. While it smelled lovely, however I don't personally believe skincare products should have any added fragrances unless they are produced naturally. For example anything you use with lavender will naturally have a smell, however if its added in, I would not recommend that. So I would ask the company to clarify if this products fragrance is natural or has been added in. With all that being said their customer service is awesome. My product got lost in the mail and took awhile to reach my sisters' house because when the shipping label was printed, it was printed with half the address missing. As soon as I noticed that, I contacted their customer service who literally within less then an hour got back to me and located the product. Since I had the tracking number I was able to see that it was lost based on the info provided by the mail carrier. So kudos to them for having such an effective customer service operation that was proactive in looking into the shipping issue from me without having me going back and forth by email hundreds of times. So if you are looking to try a cleansing balm with an awesome muslin cloth, then look no further and check out this product! I tell you right now you won't regret it! In memory of my "kidnapped" muslin cloth! I shall miss thee! Sounds like a wonderful product. Maybe, in return for them knowing you did this glowing review, the people you purchased this from might send you another cloth free? Could be worth a try. Alana visiting from UBC.